Why someone hasn’t reviewed this game by now is not surprising. I think the feeling is that such a brilliant game deserves a similar review. Whilst my review may not be brilliant, I’m going to try telling you what this game means to me and give it the praise it deserves. 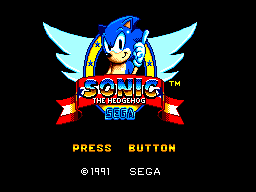 Our blue spiky hero came about in 1991, when Sega created a new mascot to precede Alex Kidd. 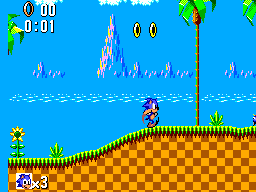 Sonic the Hedgehog was released for the Mega Drive and rather than just porting it to our beloved Master System, he was thankfully given an original adventure. The storyline has Dr. Robotnik snatching animals from planet Earth and our hero has to take him and his evil robots down. You can also collect the 6 emeralds in the process to help rid pollution. The SMS has its fair share of platformers, but none like this. The speed and fluidity of the game are unmatched. With a game that needs only one button to play, you may doubt its ability to hold your interest but boy, you’d be wrong. The levels are pretty big and there are several stages, all fantastically designed. You have to jump and spin your way through the levels collecting rings and power-ups as you go, which include the shield, invincibility, extra lives (there’s one in every level you know), and quite strangely, just the one speed shoes. There are some good little secrets and the emeralds can be quite a challenge to find first time playing. There are also bonus levels which involve a lot of rings and bouncing which can be fun but sometimes frustrating. It’s incredibly easy to pick up and play but still a challenge to beat (the second jungle level and labyrinth stage being particularly tricky). For the SMS’s capabilities these graphics are pretty much perfect. Excellent colour, sprites, backgrounds, animations, the lot. It runs at en excellent speed and never with any jerkiness or slowdown. The levels are fantastic and each stage’s theme is memorable. 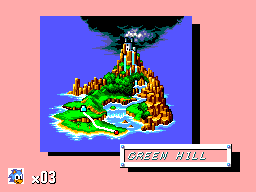 Even the map you see before the start of the level is interesting and gives you even more of a picture of this wonderful world you play through. Once again, perfect. The title theme is instantly recognisable and there is a memorable and beautifully composed track which fits each stage perfectly and just really immerses you into the game (well it does to me anyway). These tracks are so good, that I’ve converted them to polyphonic ringtones and when my phone has rang someone has said, ‘Hey, cool ringtone’. My favourite tracks have to be the very upbeat Jungle stage and the serene Bridge stage. The sound effects are also good and never annoying. Simple and very responsive, can’t get any better than that. Handling Sonic is a dream and really gives you full control. Of course to make it interesting it controls differently when under water to give you a more realistic feel, and it works well. You basically have; move left and right, look up and down (screen moves the way you look, nice) and either button for jump. You can also use a spin attack by pressing down when you’ve gained some forward momentum. All of these moves can be useful. If you’re playing it first time it’s quite a good little challenge to complete. Then you can try finding all the emeralds. Then you can try finding all the extra lives (there’s even one on the last boss). Then you can just play it over again for fun. I know I do, regularly. I come back to this game all the time just for the sheer joy I get out of playing it. Even after 15 years, I never got bored of this game. It really takes me back to my youth and I get lost in the utter magnificence that is this game. Ahem, yeh it has good replay value. No doubt every Master System owner has this game or has played it one time or another. If you haven’t, what the hell is the matter with you? It was recently voted second greatest SMS game for good reason. This is a game you must own, especially considering how common it is. It is brilliant in every aspect and really shows what the SMS is capable of. Although Sonic has had several sequels and has been on more powerful machines with 3d makeovers and what not, this is the greatest Sonic game for me. In short, I love this game.